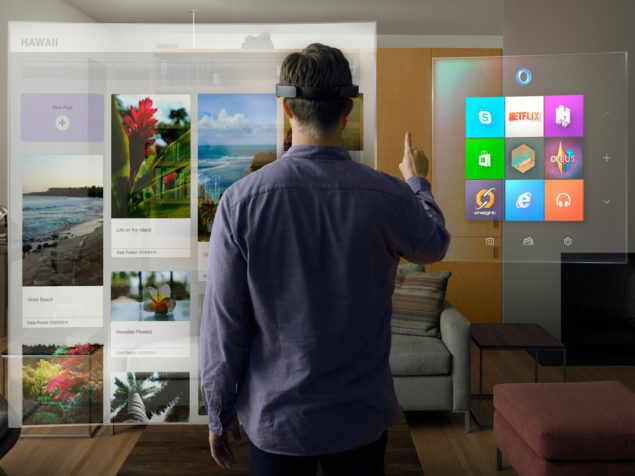 Microsoft’s HoloLens was a revolutionary unveiling to say the least. One of the more abstract points about the reveal was the integration of Windows 10 and HoloLens at a very low level, with the HoloLens API integrated into the parent os. Microsoft has now confirmed that all Universal Apps will be compatible with HoloLens – in other words, double as a hologram. Basically, the holographic functionality will need to be coded directly into universal apps, which will after all be nothing more than a glorified skin or GUI. Third party apps can also start integrating HoloLens functionality using the HoloLens API. HoloLens will use motion tracking and match moving techniques to then apply the 2D interface on any flat surface (or static in air). To do this, HoloLens will have to match move the camera in real time, which is no mean feat. When talking about match moving, planar tracking is relatively easy however apps that require dynamic objects interacting or moving in 3D space (think a game character jumping around the room) will be exponentially more complex to process and it is unclear how Microsoft will manage that without external processing at the moment. But hey, its 2015, and we finally have proper holographic technology – or atleast the first signs of em anyway.